Sliced bread. It regularly receives accolades as being the last greatest thing. Not the Internet. Not the automobile. Nope, sliced bread beats them all. Well, fortunately, we've discovered something that rivals the greatness of sliced bread. 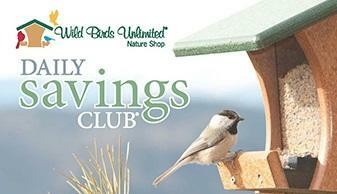 It's called the Daily Savings Club®, and it allows you to save every day on the best birdfood in town. For an annual membership fee of only $25, you'll receive 15% off regular, every day bird and wildlife food prices and an additional 5% off sale prices of bird and wildlife food at the Wild Birds Unlimited store of purchase. So as prices rise around us all, you're guaranteed to get the best price on the best birdfood in town - every day. Now that's a great deal. And by joining the Daily Savings Club, you'll get a $10 Bird Buck for every $200 dollars you spend on any merchandise in the store. You'll also be rewarded with a FREE gift as well as Club-member-only specials. So take a seat sliced bread. There's a new "greatest thing" in town. And it's only happening at Wild Birds Unlimited. Stop by the store this month for all of your nature needs and be sure to ask us about joining the Daily Savings Club. You and your birds will be glad that you did.